Grand Vu is a beautiful and quaint vacation rental cottage in Lutsen, MN on the desirable Cascade Beach Road. Lake Superior is just steps away and Cascade River State Park is just minutes away. 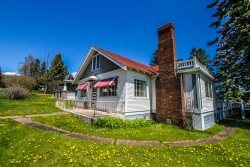 Grand Vu is a classic Lake Superior cottage, just steps away from the water, with a lovely sense of privacy. The home has fabulous views of Lake Superior inside and an expansive cobblestone beach, perfect for skipping rocks and roasting marshmallows by a bonfire. Located on the highly desirable Cascade Beach Road just 10 minutes from downtown Lutsen, MN. You can even see the Grand Marais Coast Guard Station from the beach and are just 10 minutes from the picturesque town itself. Grand VU is a two bedroom, one bath home all on one level with relatively easy access from the parking area. The beach area is accessible down a flight of stairs with a handrail, making it easy access for most. Come and enjoy the gas fireplace and well-appointed home on your next North Shore vacation. The location of Grand Vu is its biggest highlight, and we're not just talking about its proximity to Lake Superior! The Lutsen area offers everything from miles of hiking and biking trails to the Lutsen Mountain Ski Recreation Area which features an alpine slide and scenic gondola to the summit of Moose Mountain during the summer months. From there you can enjoy breathtaking views of Lake Superior- a must-do during leaf change season in the fall. Cascade State Park is just a couple of miles away and features a gorgeous waterfall after a short, easy hike, plus a restaurant and bar. Take a day trip up to Grand Marais, about 15 miles away, and enjoy the many locally owned, unique shops and restaurants that attract thousands of visitors each year. So whether your plans for visiting the northwoods was to relax or to find an adventure, Grand Vu is a great base camp for everything you could want to do being just a short drive away. At the end of your day, come home and start fire up the gas fireplace or get a bonfire going on the beach. Relax with the sounds of Lake Superior lapping against the shoreline, birds in the trees, and your friends and family nearby. Pets are welcome with prior approval and an additional fee. 2 pet maximum. *The staircase to the shoreline was washed away in a storm. Shoreline access requires climbing down the rocks. Very nice, comfortable furnishings with great open floor plan. Beautiful lot and private. Beach is awesome. Great walking from cabin on road or in state park across street. Perfect location for day trips to! It is a well organized company, but the prices are too high for many. The views from the home were amazing, and we enjoyed the private setting. The space was perfect for two people and a dog. We really appreciated being able to bring our dog along. Great, very easy and helpful. The website is a dream. Beautiful location and perfectly situated between Grand Marais and Lutsen. The house was perfect for us, a couple, and we think it would still be comfortable with another couple as well. Very comfortable furniture and the kitchen had everything we could need. Very responsive and helpful. We will be back next year. Grand Vu is a classic old lake cottage. Not new, but very comfortable. It is a lovely, light cottage so it is even pleasant on rainy days. The deck is a great place to sit and read and listen to the lake. It needs better stairs to the beach. We are old and the stairs were a real challenge to us. We love this property! The location near Grand Marais is perfect. Great view of the lake! Your office staff was so helpful - we needed more sleeping space, and were able to book space at Chateau LeVeaux through you, even adding a third night easily. The two-part auto-payment worked really well. The correspondence about check-in, access, departure expectations - all was done well. We couldn't have asked for a more perfect location for our North Shore time away: cozy, complete cabin, as close to the lake as you can get, without a neighbor in sight. Trails in Cascade River State Park are walking distance away - Lookout Mountain is an after-dinner stroll! Always friendly, helpful and great follow through if we ever need any help. We love staying at Grand Vu. It's location is perfect - right on the shore line, close to Grand Marais and Lutsen, very private with amazing views out the big windows and the deck right on the rocks. Great team and very helpful. Loved our vacation at Grand Vu. It was just as decribed. It had everything e needed for a great vacation. You are all very nice. Professional. Ready and willing to help. And actually helpful! LOVE the location. Nicely decorated. Kept up so-so (could have been vacuumed better behind couches. lot's of dead flies). Nice bathroom and shower. Nice beds and mattresses. Suggest a screened in porch. The location was phenomenal! Great proximity to Grand Marais and to other area scenic sights. Right on the waterfront couldn't have been more spectacular! This is an absolutely adorable cottage with the perfect view and location. We wished we could buy it and give it a remodel, because it has a great floorplan. Loved the big picture windows, patio. The house itself is stuck in the 1950s, and desparately needs to be remodeled/upgraded. See more thoughts below. Great location for seclusion. We enjoyed the whole grand by experience. This was our second time staying at Grand Vu. We love the cabin, the seclusion and the location. Location was perfect. So close to the water! And close to Grand Marais. We arrived late Thursday night and found everything to be just as was noted on the information. The home was clean and cozy for us to settle in that night and we woke to a beautiful view of the lake. We enjoyed the fire pit on the shore at night and found the location to be so convenient to Grand Marais and other special hiking spots. It was really special to have a house vs. being in a "resort". We loved the privacy and quiet space inside and out. We enjoyed hearing the water splash against the shore! We loved the home! The location was perfect. We loved the setting it's very private. The beds were VERY comfy! The view of the lake is amazing from the living room because of the giant window. There were 3 negatives..... only part of the toaster worked. The DVD player kept freezing up when we tried to watch a movie. The beginning of the stairway to the lake is precarious. If there was another step or two at the top or if the railing came up higher it would help a lot. The view of Lake Superior from the house was great. The beach is only a few steps from the deck and makes for great rock collecting. The weather was excellent and the trails at Cascade State Park are right across the road. Will definitely will stay again. Great location beautiful cobblestone beach. Very private. Live the new gas fireplace. One area of improvement. The stairs leading to the beach could use am additional handrail at the top where it transitions from boulder to wooden top stair. The location was excellent. It was quite and wonderfully private. the rock beach and many lake facing windows were so nice. I could lay on the couch and stargaze at night. Then only thing I could mention as a negative was the bathroom was pretty cool when the rest of the house was comfortably warm. I noticed a space heater in a closet, so I'm guessing that may go in the bathroom. Overall we LOVED it. Love the proximity right on the lake. Like the fact that it had greenspace between it and the neighboring properties for a sense of being int he woods. Loved the large picture windows facing lakeside.